Banyumala is located in Wanagiri district near the northeastern end of Lake Buyan. 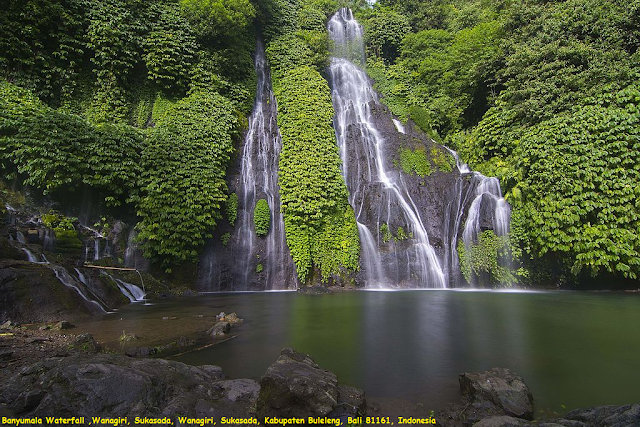 It is on the crater rim road between Munduk and the main highway from Singaraja to Denpasar. This is not an easy waterfall to find. There is a faded sign leading down a small rural road away from Lake Buyan. This is the easy part. After this there are a series of painted orange arrows with a several left and right turns ultimately ending up on a single track motorcycle trail. It is recommended that you try to hire a guide. It might be possible to get there using the GPS coordinates.